Urbanaut® and SemiMaglev™ Urbanaut® are registered international trade names of the Urbanaut® Company Inc, which has been involved in all aspects of monorail technology for more than 15 years. It is one of the most experienced monorail firms, specializing exclusively in planning, design, research, studies, testing, manufacturing, construction and operation of the Urbanaut®, a new innovative electrically operated monorail technology applying conventional rubber tire wheel bogies and SemiMaglev™ Urbanaut® technology. The basic principle applies a 1.1 meter narrow guide way, with a center guide and stabilizer rail, which also serves as a simple switching device. Intermediate size vehicles are lightweight: 2.35 m. wide and 3.2 m high. The concept has wide practical application as low cost conventional and high speed systems, and has the potential of moving large numbers of people to relieve traffic congestion along freeways, on crowded city streets, in urban settings and in recreation areas. The technology has been easily adapted to different types of propulsion for rubber tires and semi maglev technology. Urbanaut® is the only monorail system where smaller vehicles operating on a smaller guide way (a circulator) can be integrated with and switched onto a larger high capacity guide way, allowing a fleet of vehicles to be transferred for specific purposes, such as during rush hours, and for large public gatherings and sporting events. Studies indicate that a median to high speed Urbanaut® backbone system is technically and economically feasible for placement in the median of many of our freeways. This medium to high speed Urbanaut®, depending on distances between stops, can have the potential capacity of an 8 lane freeway at considerable less cost with no pollution and noise, and little or no environmental impact. Such a medium to high speed trunk line system can be integrated with transfers to independent Urbanaut® monorail guide ways into cities, airports, recreation areas, and high density communities. The technology is uniquely flexible since a smaller, narrower vehicle operating on a smaller guide way can be integrated with and switched onto a larger guide way. The Urbanaut is not dependent on a massive beam way like the existing 60 year old Hitachi, Bombardier and Malaysian monorails, which are much heavier, more costly and have little flexibility. Urbanaut® has extensive Pro Engineering and other data for manufacturing aerodynamic shaped passenger vehicles with a unique, ultra light weight high tech bogie with in-wheel electro-magnetic propulsion and maglev linear induction motor traction (MLIM) for high speed. Extensive testing has been done with prototype operational models, confirming design and engineering data. Urbanaut® has extensive reliable cost data of factual projects incorporating independent contractors and component suppliers, and has ready manufacturing and construction data for world wide marketing of the technology. The first stage of the Wolmido Monorail in Incheon City, South Korea is now under speedy construction and is expected to be in operation in August 2009, with only one year of construction. Second and third stage expansion will follow immediately upon completion of Stage One. Urbanaut has world wide interest in its technology, involving small PRT systems and large capacity systems for urban and inner city transportation solutions. Extensive information on the technology, including costs, can be found at "Urbanaut.com". Mr. Einar Svensson, President of the Urbanaut® Company, Inc. has a successful extensive international broad business background in construction, design, engineering, development, manufacturing and management in Europe, Canada, Asia and U.S.A. He is a consulting professional licensed Civil and Structural and Transportation Engineer in the USA. His engineering degrees are from schools in Europe and the U. of Washington, U.S.A. and he is a Member of the Civil Engineering Association, U.S.A. He has been in management and organizational leadership all his life. He is one of the few experienced world authorities on the practical and theoretical aspects of monorails, having devoted the last 15 years exclusively to all phases of the Urbanaut® technology and has been active in monorail transportation technology since 1960. Mr. Svensson invented, tested, developed, patented, and trade named Urbanaut®, a superior monorail technology which differs uniquely from other monorails. He personally owns all the world wide patents and trademarks on the Urbanaut technology. Mr. Svensson previously was a principal with the now dissolved Alweg Company which marketed and constructed a monorail technology world wide, in which technology the vehicle envelopes and is dependent on a large beam way. Alweg technology is now marketed by Hitachi of Japan, Bombardier of Canada, and Malaysia. He has since been an advisory consultant for the Seattle Alweg monorail. Mr. Svensson is a key engineer and advisor on the Urbanaut Wolmido Monorail in Incheon City, S. Korea, scheduled to start operation August 2009. He speaks and reads English, German and the Scandinavian languages and has written papers and documentaries in several languages related to monorail technology, engineering, construction costs and operations. He lives and has a monorail engineering, management and marketing office outside Seattle, Washington. He has lived in Norway, Canada and U.S. He is married, with 2 adult children. For several years he owned and managed his own national housing manufacturing business. He has broad experience and investments in real estate development, which has financed the Urbanaut technology development. He has been actively involved in cross country ski competition throughout his life, winning World Master Championships many times. He has top level cross country coaching licenses in Norway, Sweden and the U.S.A. and has written a comprehensive book, "Ski Skating With Champions", marketed by Amazon.com, which introduces mechanics and dynamics to ski skating technique. Mr. John E. Svensson, Vice President and Technology Director, has broad international technology and high level management experience. He is director of the Urbanaut® Technology, which involves the engineering data process for testing and manufacturing Urbanaut® vehicles and structural components. He has done extensive model bogie and vehicle testing applying metal and composite materials and has experience in propulsion and wheel technology and manufacturing of products made of high strength alloys, plastic and fiber optics. He is Urbanaut's management director for the Wolmido, Incheon Monorail, S. Korea, where he supervises a team of Urbanaut professionals. He has exceptional technical and personnel management capabilities and has coordinated successful large scale manufacturing businesses and marketing worldwide. He has been involved with his father, Einar Svensson, in the development of the Urbanaut Monorail Technology and marketing for nearly two decades, and has shared the financing of promoting the technology. During the last 15 years, he invented, designed, tested and managed several new product lines, businesses that have grossed several billion dollars. 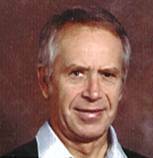 He is also the inventor, owner and manufacturer of a company developing high tech rubber cushion composite wheels for inline skating, and partner/owner of a successful Canadian hockey equipment manufacturer. He has been a high level competitor in snow skiing, kayaking and in inline skating competition. He is married with 3 children and divides his business and personal time among Pusan, South Korea; Bangkok, Thailand and Seattle, Washington. The Urbanaut® Company Inc. and Einar Svensson, Consulting Engineer over the last 15 years have pursued continuous innovative studies and improvements parallel with application and development of new technology and have thousands of proprietary documents related to the technical, practical, functional, economical and operational aspects of monorail technology, together with studies made of potential factual installations, including the Wolmido Monorail, now under construction in South Korea. 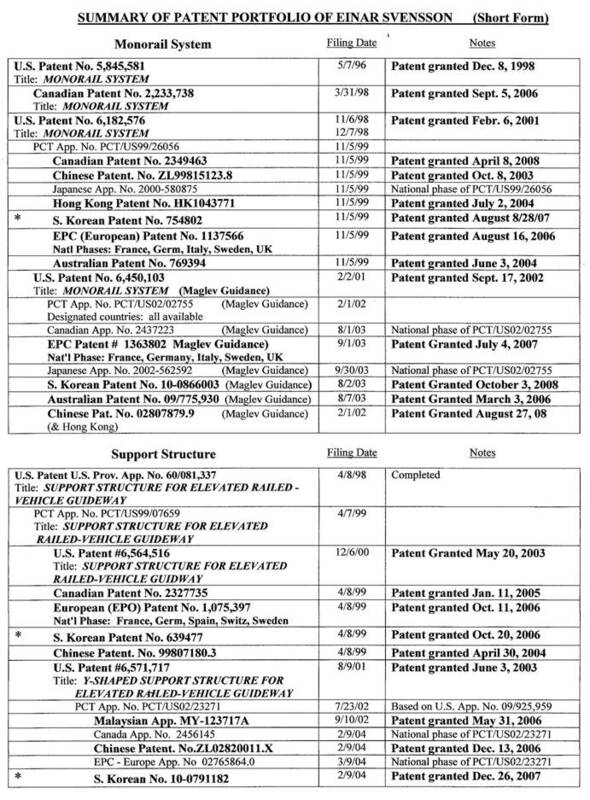 The Patent Portfolio attached is a listing of U.S. and international comprehensive strong patents issued in the name of Einar Svensson on vehicle components, propulsion systems, elevated structural guide ways, stations, and switching for conventional and SemiMaglev™ Urbanaut® technology. The patents include Full Maglev and SemiMaglev™ Urbanaut® concepts for high speed. The patent matters are a continuous on-going process, which involves new innovations and improvements on all aspects of monorail technology, manufacturing and methods of construction. Urbanaut® is a unique, entirely different, simplified and less costly monorail technology much smaller, of less weight with lots of flexibility, and is not dependent on a massive structural beam way as are most other heavier and more expensive monorails in operation today. Technologically there is no other monorail which resembles it; the patents, therefore, are strong and independent. 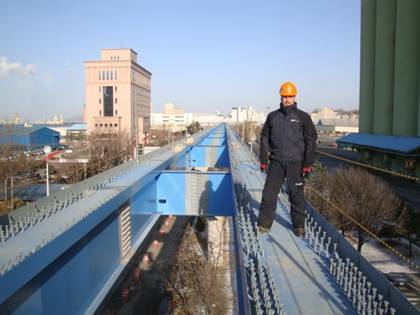 There is an extensive amount of Urbanaut® Technology and cost data on the internet at "Urbanaut.com", including construction of the Urbanaut Wolmido Monorail, Incheon, South Korea. v A comprehensive interactive CD containing Proprietary Information on the Urbanaut® with illustrations and ProEngineer data. v Several Power Point presentations of Conventional and SemiMaglev™ Urbanaut® technology.